Do you have teeth that are damaged or missing? At Riverheart Family Dentistry, we can restore your smile the way you need and deserve. Dr. Schwarz leads our comprehensive dental practice as a gentle dentist with skilled expertise in restorative dentistry. We recognize the importance of replacing missing teeth. Not only do missing teeth bring insecurity or poor self-confidence, but they can also cause your existing teeth to shift out of position and disrupt your bite. Whether you've experienced tooth trauma, extensive decay or advanced gum disease, you can trust Dr. Schwarz to restore your smile with a beautiful solution that also meets your budget and lifestyle needs as well. 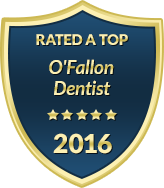 Our dentist office in O'Fallon is committed to helping patients preserve their natural teeth whenever possible. However, we also recognize the need for top quality tooth replacement options when necessary. When it comes to replacing a portion of your tooth structure or your entire tooth, we offer dental restorations that look, feel and function most like your natural teeth. Restoring your smile is something that requires trained skill and artistic precision. Dr. Schwarz works closely with patients who need tooth replacement to help them make informed decisions regarding their future smile. Regardless of which dental restoration you choose, you can trust that we will make any adjustments necessary to ensure your new smile is crafted to optimal comfort and aesthetics. Whether you are replacing a single missing tooth or need a full mouth restoration, we will work hard to create a seamless and comfortable process. Our office includes modern patient amenities and sedation dentistry options to ease your anxiety during restorative procedures. With our state-of-the-art dental equipment and a friendly, compassionate staff, we give patients a truly rewarding experience when it comes to dentures or dental implant restorations. Contact us today to learn how you can regain a complete and confident smile with our expertise in restorative dentistry. Dr. Schwarz is passionate about rebuilding smiles to improve your quality of life.